Welcome to the first release of DiskIt, the diskette catalog manager. First of all, thank you for evaluating and, of course, registering DiskIt 1.0. As you've no doubt heard, you (the upstanding computer user) provide the necessary funds for shareware by registering this software. Really, people, the shareware marketing concept provides an alternative to money gouging software monopolies (no names, of course). Without all the legalese, please register this software if you use it. There you have it: That's the completion of our integrity pep talk today. - Automatic file information retrieval: No manual entry. - User definable descriptions for each file. DiskIt was created using The Whitewater Group's Actor development system for Microsoft Windows. Why Actor? We think it will better enable us to enhance DiskIt and produce other software products in the future. Although Actor has its drawbacks, it enables us to more quickly create and update software. The quicker turnover should provide the user with a quality product in less time. DiskIt is a disk cataloging program written for Microsoft Windows. DiskIt is designed to provide all the general capabilities needed by a disk cataloging program while remaining very easy to use. This section is meant to help you get up and running with DiskIt (if for some reason you don't feel like reading the whole manual). Once you get DiskIt started, there are only a few things you need to know to take advantage of DiskIt's functionality. To read in catalogs off a disk, simply choose Add from the Catalog menu. Once you choose the drive, DiskIt will read in the disk. If the disk does not have a volume name, DiskIt allows you to enter one; DiskIt will write this volume name to disk in addition to using it to track the files you've just read into DiskIt. You can continue reading in disks in this fashion. Once you've read files into DiskIt, the first thing you should do is save the entire data file. To do this, just choose Save As from the File menu. DiskIt's default file extension is .DAT, but you can use any file name you want (within DOS's limits) for the data file. The next thing to try is manipulating the display. There are two displays you can toggle between by using the View menu. Drop down the View menu and choose File. DiskIt will display all files alphabetically, without any volume information. Now drop down the View menu again, and choose Disk. The display now sorts files by the disk they are on, in addition to displaying information about that disk like volume name, space free, and disk size. The second way to change the display is by using the Display! menu. This brings up a dialog box containing the various file information you can toggle on and off: Attributes, path, volume label, date, file size, and description. Checking the box next to one of these boxes turns the display of that attribute on. The third and final way to change the display is through the Sort By menu. You can sort by file name, extension, date, size, or description. To choose a sort, just drop down the Sort By menu, and pick the sort you want (a check mark denotes the current sort). There you have it. We hope you enjoy using DiskIt! If you like this program, or use it regularly, please register it. We would also appreciate your comments, suggestions, questions, and ideas. We especially enjoy receiving new product ideas; also keep your eye out for new products from us. Registered versions of DiskIt also include complete printed documentation (with screen shots) and an About Box with your name. In the registered version, the About Box does not appear when the program is started. Welcome to the first release of DiskIt. Thanks for supporting us! Really, people, the Shareware marketing concept provides a great alternative to money gouging software monopolies (no names, please). Please support us by registering the software. The more money you send us, the more products we produce - and we have some really good ones slated for release in the next 6 to 8 months! DiskIt was created using Whitewater Group's Actor development system. Thanks to Jeff Autor and Mike Maley for beta testing and helping distribute our product. Windows is a registered trademark of Microsoft Corporation. Actor is a registered trademark of The Whitewater Group. All products mentioned in this manual are registered trademarks of their respective corporations. Where did you hear about or download DiskIt? What features, if any, would you like to see added in future versions of DiskIt? How can we imporove distribution and support to help the end user? Would you be interested in a customized version of DiskIt? This software and manual are sold "as is" and without warranties as to performance or merchantability or any other warranties, whether expressed or implied. Because of the various hardware and software environments in which this program may be used, no warranty of fitness for a particular purpose is offered. DiskIt is a SHAREWARE program; it is NOT public domain software, nor is it free software. DiskIt requires the user to register the program if he or she intends to use it except for the purpose of limited evaluation described below. Registration grants the user a license to use DiskIt on a single computer at any one time. Non registered users are granted a limited license to use DiskIt on a trial basis for the purpose of evaluation. All users of DiskIt are granted a limited license to copy the product only for the trial use by others, provided that DiskIt is copied in its full and unmodified form. The copy must include all files necessary to permit full operation of the program. It must also include this license agreement, registration form, warranty, and documentation. Use of non registered copies of DiskIt by any person in connection with a business, corporation, educational institution, or government agency is forbidden. Such users must register the product and/or purchase a site license. DiskIt 1.0 is a Shareware program conforming to standards as established by the Association of Shareware Professionals. Microsoft(R) and Windows(TM) are registered trademarks of Microsoft Corporation. PKZIP(R) and PKUNZIP(R) are registered trademarks of PKWARE, Inc. Anyone wishing to charge people a fee for giving them a copy of DiskIt must have the written authorization of the authors, without which the distributor is guilty of copyright violation. To receive such authorization, send this completed application along with a copy of your software library's order form to: Stephen Drone, P.O. Box 8041, Wilmette, IL, 60091. Include $10 to cover the costs of processing the application and sending you the latest version of DiskIt. For distributors already recognized by the Association of Shareware Professionals, this application is not necessary. 1. The fee charged may not exceed $8, including postage, mailer, and any other charges. 2.Your library's catalog or listing must state that DiskIt is not free, but is copyrighted software that is provided to allow the user to evaluate it before buying it. 3.The offering and sale of DiskIt will be stopped at any time upon request of the authors. 4.Copies must be made from the copy of DiskIt sent to you with this agreement. 5.Problems and complaints will be reported to the authors for resolution. In return for the right to charge a fee for the distribution of the DiskIt software, I agree to comply with the above terms of distribution. The disk catalogs you use Diskit to track will be kept in data files with the default extension .DAT. Each file may contain as many disk catalogs as you wish. You can simply track all your disks in one data file, or you can split up your disks into several different catalog files. This display will not show any files until you add disk catalogs to it; this procedure is described in the Working With Catalogs section. DiskIt lists the current directory at the top of the dialog box. If you see the file you want to open in the box at the lower left, simply double click on the file name to open that data file. If you do not see the file want, you can use the Directories box to look for the file you want. Double click on a drive letter to pick a disk drive, then use the mouse to choose the directory you want to look in. Once you find the file you want, just double click on the file name to open that file. If you have saved the data file with some extension other than .DAT, you should type *. * in the Files box, instead of *.DAT. If you want to cancel the operation, simply click the Cancel button. After you've started a new catalog by choosing New from the File menu, you can start adding disks to your catalog data file. To add the files from a floppy disk to your current catalog, pull down the Catalog menu with the mouse (or -) and choose Add... to bring up the Select Diskette Drive dialog box. Choose the floppy drive that the diskette is in from the selection box (if more than one drive is available, click the down arrow next to the selection box to get a list of drives) and click the OK button. To cancel the operation, click the Cancel button. Notice two things: All files and their associated paths are listed. Also, if the disk has no volume name, you are prompted to enter a volume name for DiskIt to use. Please do so. While you're at it, label the disk with the appropriate volume name. You'll thank us for it. To continue, click the OK button. To cancel the operation, click the Cancel button. The list of files form this disk is now added to your current catalog. We highly recommend saving your work quite often. To save the catalog you're currently working on, just choose Save from the File menu. If your data file does not have a name, DiskIt will save it as UNTITLED.DAT. Simply type in the name you want to use for your file (it must be 8 characters or less); the default DiskIt extension for the file is .DAT. The current directory is shown at the top of the dialog box. You can use the Directories box to choose the drive and directory you want to save the catalog in. Once you've chosen a file name, drive, and directory, hit the key or click on OK to save the file. To cancel the operation, click the Cancel button. 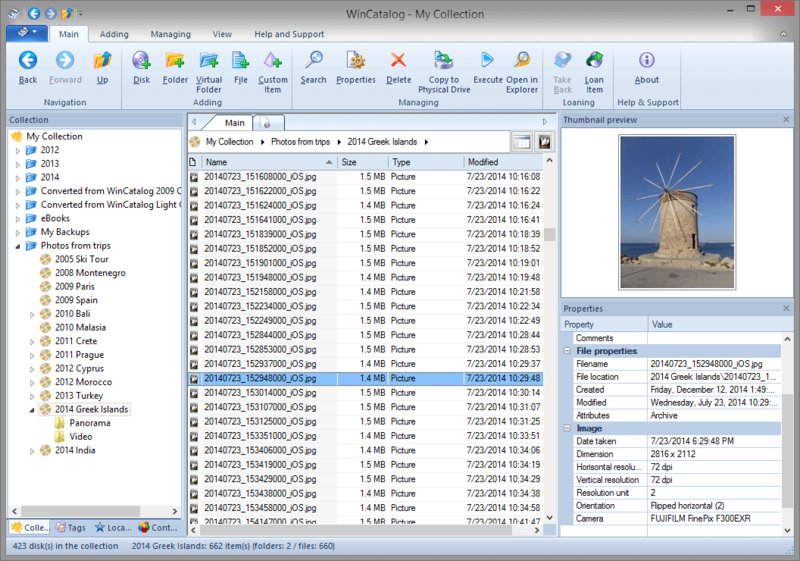 The Files scroll box contains a list of all the files in the current catalog. Click the down arrow, then use the scroll bar to find the file you want to add a description to; click the mouse on that file name to highlight it. You can also use the right and left arrow keys to highlight the file you want to describe. Once you've highlighted the file you want to describe, just type the description you want to add to that file into the description box. This description can be up to 200 characters long. To save the description, hit the key or use the mouse to click the OK button. If you hit the key, you can enter multiple descriptions by choosing the next file you want to describe. To cancel this operation, click the Cancel button. For the second method, simply double click on a file name from the main DiskIt screen. The will bring up the Add a Description to a File dialog box; the file you double clicked on will already be highlighted. All you have to do is type in the description and hit the OK button. Use the Volume Name: drop down box to pick out the volume you want to delete. After you pick a volume, DiskIt will display the files in that volume in the Files Listed for Diskette box. Be sure this is the volume you want to delete! To delete this volume, click the OK button. To cancel this operation, click the Cancel button. NOTE: You cannot delete an individual file from a DiskIt catalog. To delete a file, you must delete the entire volume the file is in. The Update Catalogs choice in the Catalog menu allows you to update the information in the current disk catalog. Simply choose the volume name of the disk you want to update, then click OK. CAUTION: Once you choose OK, you MUST update the information in DiskIt from a diskette. When you choose OK, the information for that volume in DiskIt is erased. After choosing OK, you will be prompted to insert a diskette in a drive. Choosing Cancel at this point will abort the update. If you would like to check the contents of a diskette before updating it, you can choose Add from the Catalog menu to view the contents of a disk. You can then cancel the operation once you've verified the contents of the disk. You can easily change the way you look at disk catalogs in DiskIt through the View menu. The View menu contains two choices: Disk and Files. When you are are using DiskIt, you are always using one of these two views. Notice that the display looks much like a DOS directory would look on your computer screen. The disk volumes are sorted in alphabetical order, and the files in each volume are sorted in any order you choose (from the Sort By menu). This is the File view. Notice that this display looks much more like a database or spreadsheet listing than the Disk view. In the File view, the sort criteria you choose in the Sort By menu applies to the entire file listing, not just the files within each volume. All files in the catalog are listed consecutively. Of course, the Disk And Files views do not have to be sorted by file name as in the previous two examples. Use the mouse to pull down the Sort By menu (or press -); you will see a list of the available sort attributes. Once you've pulled down this menu, simply choose the attribute you want to sort by with your mouse, or press the appropriate underlined letter. After you've made your selection, DiskIt will re-sort the display. If you are in Disk view, the files within each disk volume will be sorted in the order you chose. If you are in Files view, the entire catalog will be sorted. Note that if you save the catalog after changing the View or Sort by attribute, these new attributes will not be saved. When you open a file, DiskIt automatically chooses the Disk view, and sorts the files by file name. By default, in the Disk view, DiskIt displays the file name, path, file attributes, file data, file size, and description for each file in the view. It is very easy to change the information DiskIt displays about each file. Simply pull down the Display! menu with the mouse (or use -) to bring up the Display... dialog box. Each of the boxes functions as a toggle. Clicking the mouse in the box next to an attribute turns the display of that attribute on or off. You can also use the arrow keys to move the highlight box to each attribute. Hitting toggles the display attribute on and off. You can then move the highlight box to the OK or Cancel button. Choosing the Cancel button cancels any action; choosing the OK button tells DiskIt to re-display the current view showing only the attributes you have chosen. Notice that turning the Volume Label display attribute on or off while in Disk view has no effect. By default, the Disk view will always display the volume name. Occasionally you may need to find some piece of text in your catalog; it could be a file name, a volume label, or part of a description. You can use the Search menu in DiskIt to find any piece of text in you catalog. Simply type in the text string you want to search for (the search is not case-sensitive) and either click the OK button with the mouse, or hit the key. To cancel this search, click the Cancel button. where 'text' will be replaced by the text string you were searching for. To perform a case sensitive search, simply click the mouse button in the Case Sensitive box. If this box is not checked, DiskIt will search for any occurence of the text you specify, regardless of case. To search for the next instance of the text string, choose Find Next from the Search menu. To search for a different string of text, simply repeat the process. As in most Windows applications, you can use the Clipboard to move data from one app to another. Choosing Copy All from the Edit menu will copy the current view of the data file you are editing into the Clipboard. You can then paste this into another application. You can scroll through this window and pick topics to find help on the major functions of DiskIt. To close this help dialog, simply press the OK button with the mouse. To close the Help For DiskIt window, just click the Cancel button. For further help, please consult the manual (if you don't have a copy, you can get one by registering DiskIt). There are several ways to get technical assistance for DiskIt. You can also give us feedback on DiskIt and its documentation. We'd like to hear from you! You can also reach us at any time via Snail Mail (the U.S. Postal Service). Address your lettters to Stephen Drone, P.O. Box 8041, Wilmette, IL, 60091.